Alexander the Great still makes the headlines! After the recent speculations around the Tomb of King Philip of Macedonia in Vergina, wondering if this is indeed the tomb of Alexander’s father, there have been other new findings of two tombs in that vicinity, one of which might be that of Heracles, the illicit son of Alexander and Barsine. Barsine had been married to Memnon, the Greek mercenary and commander in chief of the Persian army who lost the battle against Alexander at the Granicus in 334 BC. He survived the battlefield and fought back fiercely later on in defending Halicarnassus, the city which Alexander besieged, to die of some illness – not a very glamorous end for a military. Barsine, his widow, was war booty although she was a Persian royal princess and must have been a rare beauty. Alexander never included her in any wedding plans but apparently, she did fit his political ambitions, for a relation with her, could be seen as a friendly gesture towards Persia. In any case, she gave him a son and he was called Heracles. Recent excavations in Aegae have revealed the remains of a youngster who, according to one expert, could be those of Alexander’s murdered son. It is very strange however that these remains that were unearthed next to those uncovered last year were buried under unusual circumstances. Everything seems to indicate that initially they were laid to rest at another location before being reburied here, in the heart of the city. 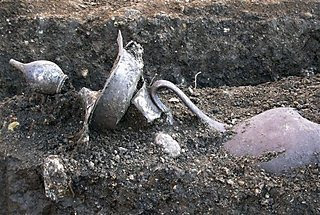 Oddly enough, these two large silver vessels were found under the Agora, close to the theatre where King Philip was murdered in 336 BC while it was common practice to entomb the dead outside the city walls. 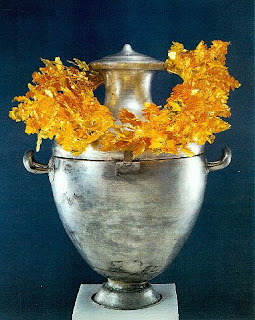 According to the article published by Associated Press, Chrysoula Saatsoglou-Paliadeli states that the silver urn looks very, very much like the one discovered several years ago in the nearby royal tumulus, close to the Tomb of Philip II. There also, archeologists couldn’t confirm who occupied the tomb, although many fingers point towards Alexander IV. 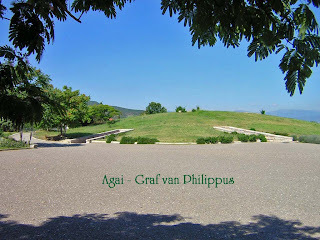 Chrysoula Saatsoglou-Paliadeli believes that this newly found grave dates from the 4th century BC and is clearly of Royal Macedonian origin because of the golden crown that was found on top. Very little is known about young Heracles. When Alexander the Great died in 323 BC, there was officially no heir to his throne. He had married Roxane a few years earlier while he was in Bactria, but their son, the later Alexander IV was not yet born when Alexander expired. Nobody had expected Alexander to die so young, he the least of all. His generals now faced the task to appoint a successor. A series of lengthy, bloody and fanatic quarrels followed in which they fought each other, jealous and envious of whatever share of the empire the other parties could acquire. This fight for power went into history as the Wars of the Diadochi and lasted for about forty years! To give some shape and stature to the royal house of Macedon, they finally decided to crown Arrhidaeus, the simple-minded brother of Alexander the Great, as king pending the coming of age of Roxane’s son, Alexander IV. Then like today, it was all a matter of political manipulation and poor Heracles didn’t live a happy life. According to Hieronymus, quoted by Diodorus, the boy was probably born in 328 or 327 BC, about five years after Alexander’s battle at Issus. There is no way to trace back how long Alexander’s relation with Barsine lasted. It is possible that she accompanied him until her father, the old Artabazus resigned as satrap of Bactria and she escorted him to Pergamon. Possibly Alexander’s marriage with Roxane had something to do with her leaving the baggage train. In any case, Barsine and Heracles both were residing in Pergamon when Alexander died and all of the sudden the boy was put in the floodlights. Of course, Heracles was half Persian but after all, he also was half Macedonian and, what’s more, the son of Alexander. The Diadochi will face the same problem later on when Roxane gives birth to a boy who is only half Macedonian too. 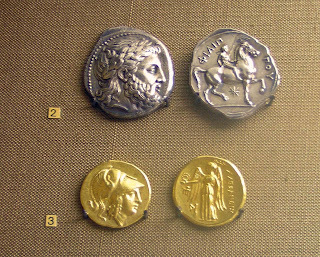 The fact that Heracles was an illegitimate son of Alexander’s was however not a problem for the Macedonians. 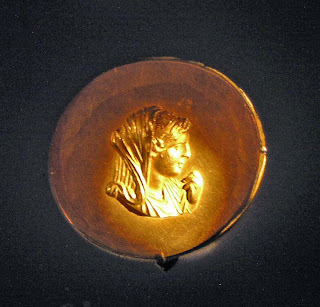 After all Alexander’s very mother was not from Macedonian stock either as she came from Epirus. After countless fiery discussions, Perdiccas took charge of the Empire as Regent until he clashed with Ptolemy, who appropriated Egypt. If we believe Strabo (and there is no reason not to), Perdiccas had “the children of Alexander” with him during his Egyptian campaign, which must mean that both Heracles and Alexander IV travelled with him - a way to ensure that neither of them would fall in the hands of the enemies. But then Perdiccas was killed by his own men in 320 BC and presumably Heracles returned to Pergamon. Then it was Antipater’s turn to take over the Regency (a task that was originally entrusted to him by Alexander himself) only to die one year later. New skirmishes exploded, this time between Cassander, Antipater’s son and general of Alexander’s, and Polyperchon, also one of Alexander’s generals. This Second War of the Diadochi ended with a treaty of both men with Antigonus, another general, and the murder of Eumenes, yet another general of Alexander’s and at one time his secretary. Truly, this entire succession of Alexander the Great was a never-ending messy quarrelling filled with countless murders and manslaughter! Meanwhile, we have entered the year 317 BC and all scruples have long been obliterated. It then is the turn of the somewhat retarded Arrhidaeus to be eliminated and a year later even Alexander’s clever and manipulative mother, Olympias can’t escape her fate and is murdered. Cassander, who once pretended to be Alexander’s faithful friend, by now is entirely intoxicated by wealth, ambition and greed, and in 310 BC he decided to poison the young prince Alexander IV and his mother Roxane! Well, he didn’t have the guts to do it himself, of course, but instructed the prince’s guardian, Glaucias to clear the job. So much for Cassander’s friendship! 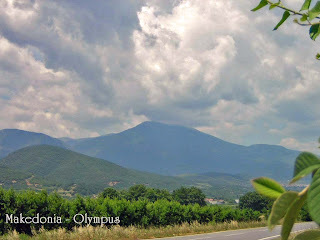 When this news reached the other Diadochi, Cassander’s enemies erupted in new speculations and conspiracies, especially Polyperchon who was master over the Peloponnesus and Antigonus who ruled Anatolia. Remaining as Alexander’s sole heir, it was obvious that all attention now focused once again on Heracles in Pergamon. 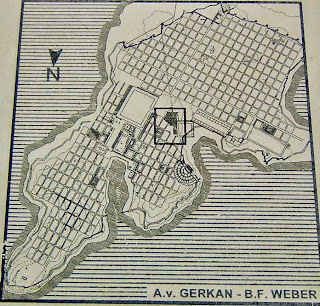 This city was part of Antigonus’ empire, and Polyperchon who was yearning to steal away Cassander’s power in Macedon conceived all sorts of tricks to achieve his goal. In his report Diodorus mentions that Polyperchon sent letters to all his friends and to Cassander’s enemies, pleading to restore the now almost seventeen years old Heracles on the throne of his forefathers. Everything went according to his plans, but while Heracles settled in Polyperchon’s camp, Cassander had second thoughts and felt uneasily threatened. He instructed a messenger to carry such attractive promises to Polyperchon as to melt their territories together and to rule jointly without having to bow to any king. The proposition sounded very attractive indeed and Polyperchon agreed with Cassander to eliminate Heracles. This happened probably in 309 BC. In his Moralia, Plutarch mentions that Polyperchon was paid one hundred talents by Cassander to kill Heracles. True or not, the story goes that Polyperchon invited Heracles to dinner but the young man asked to be excused as he didn’t trust him or was scared (rightfully so, as he’ll find out afterwards). Unhappy with this response, Polyperchon then visited the young prince in his quarters and told him “the first quality of your father you should imitate is his readiness to oblige and attachment to his friends” (Dixit Plutarch) unless the young prince would accuse him of treason? Heracles was left no choice but to attend the dinner. His meal was served and he was strangled. Justinian pretends that upon Cassander’s instructions, Barsine was murdered at the same time as her son and that their bodies were secretly hidden in the earth to erase all traces of this crime (meaning there would be no pyre as was the custom). Not the prettiest picture of the Macedonian rulers – enough to make Alexander turn in his grave, no doubt! But these facts leave us with a number of corpses that are not accounted for. We don’t know how, where or when they were disposed of. One known theory is that Alexander IV lies in the tomb next to that of Philip II in Vergina, but even that has not been confirmed. And with this new evidence, we have another theory regarding the remains of Heracles that were found in the same area, although not in a tomb. There is still no trace whatsoever of the resting place of Roxane, Barsine or even Olympias. What a story to investigate further through Unsolved Mysteries! Very interesting details about Alexander's sons. Thank you very much. Lovely to hear from you again and all the way from Poland. I do appreciate every single comment and it makes me happy to see you coming back! All the best to you and Happy Holidays. How nice surprise to hear you again! You are very kind to me, thank you. And thanks for wishes and -of course- for sharing your knowledge about Alexander. I have three favourite persons in history - Alexander, Wiliam Wallace and Crazy Horse (since two years I've learned Lakhota language....).But Alexander is the most beloved and remarkable. He always remains to me mystery. Maybe that's why I'm a little (???) crazy about him. Like you, I suppose. I too wish you all the best and Happy New Year! Gee, what a surprise that is, hearing about your warm interest for Crazy Horse! He actually is my number two favorite, can you believe that? And now you are learning Lakhota? Wow! My deepest respect! Is it out of pure interest that you decided to learn it or are there other reasons for it (if I'm not being indiscreet, of course). If my days could have been twice as long (which they are not), I would have considered a blog about Crazy Horse with the Indians in general and the Sioux more particularly. For now, unfortunately I hardly can keep up with Alexander, but then HE is the best! I wish you a very happy and fruitful 2013! Glad to make you happy. I'm sure there are not too many people interested in Crazy Horse, IF they know him to start with! I was wondering if you would consider pursueing this discussion out of the Alexander-context. In that case I would need your email address. I don't know if you are willing to share it - otherwise we'll just continue this way. Aren't we living in an amazing world where such encounters as ours are possible? Faithfull Bagoas simply disappears from history after Alexander’s death. For Greek historians he was not an interesting figure, less even than Roxane - and it’s only because she is the mother to the heir of the Macedonian throne that her death is mentioned, yet nothing about her tomb! Thank you, Robbert, for highlighting Barsine's Greek ancestry. Technically, Heracles was indeed more than half Greek, in fact 3/4 Greek. But pushing the boat further in this analytical context, since Alexander was only half-Macedonian, how "Macedonian" would that make Heracles? No more or less than Alexander IV, his son by Roxana. Yes, and poor Macedonia! Who knows, had it not been for Cassander, Macedonia could have prospered a while longer. Maybe they could even have resisted the Romans ... Maybe, of course, but this is purely my own guesswork. Poor Oxyathres, he has been totally forgotten by history. History is indeed cruel and very sad too. 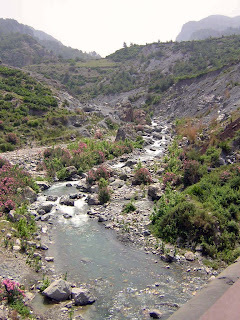 The Kalash, a lost tribe of Alexander the Great? Was Chandragupta inspired by Alexander? A statue of Alexander the Great in Athens? Alexander the Great always fascinated me, even as a teenager. I don’t remember exactly how or where it started, but the Alexander-figure stayed with me all my life. Of course, there were ups and downs, times that I was more actively involved and times I was not, but the last decennia he became very much alive again. In less happy times, Alexander is always a comfort to me; in other days he is a challenge I like to meet. Through the years, however, he remains highly fascinating and I always am out to learn more about his personality, his campaigns, his generalship and kingship but also about the impact he and his conquests had and still have on our world as it is today. More than anyone else he deserves to be called “the Great”!